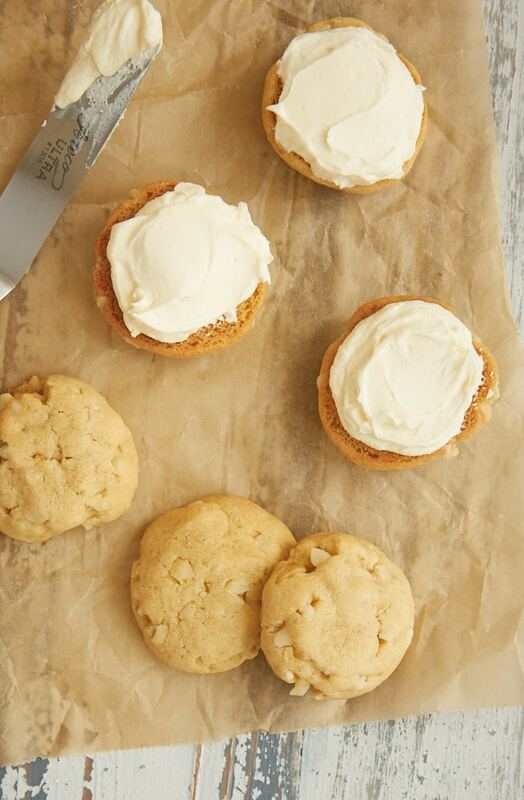 If you were to start naming classic cookies, no doubt you’d name White Chocolate Macadamia. Those have been a bakery and homemade staple for a long, long time. That sweet, nutty flavor combination is pretty irresistible. 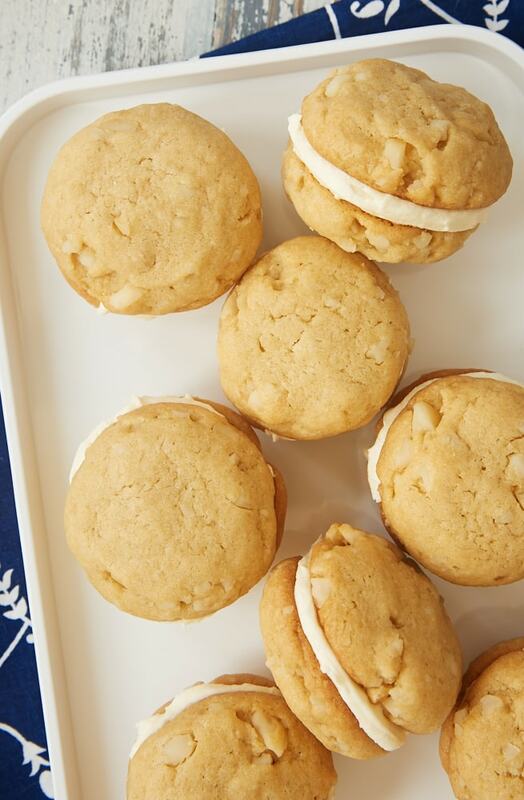 For a little twist on the traditional, these White Chocolate Macadamia Sandwich Cookies combine a simple vanilla cookie studded with plenty of macadamias with a sweet white chocolate frosting. They’re sweet and nutty just like the classic, but you get frosting! Who doesn’t want more chances to have frosting? Especially when it’s sandwiched between two cookies. Who’s with me? The frosting is a simple buttercream made with melted white chocolate. If you’ve ever melted white chocolate, you already know that it can be a little temperamental. You can use a double boiler if you like, but I am the impatient sort and prefer the microwave. Just go slowly and stir often, or your white chocolate may seize or even burn a bit. One of the keys to sandwich cookies is getting uniform cookies so that they match up well size- and shape-wise when it’s time to assemble. It’s also helpful if they’re a bit flat on top so that they’ll sit upright. I like to use a cookie scoop to make equal portions. Then, I roll each portion between the palms of my hands to make a ball. Place the dough balls on the baking sheet, and flatten each slightly before baking. I make these cookies on the small side using 1-tablespoon portions. After all, you’re going to be eating two cookies at once! This amount of frosting is just right for the yield. I would estimate that I use just a bit more than a tablespoon of frosting per sandwich cookie. That gives a good ratio of frosting to cookie for my tastes. I love to take something familiar in the baking world and find a way to make it different. 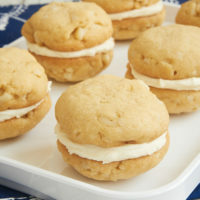 These White Chocolate Macadamia Sandwich Cookies are an ode to the classic cookie but with a fabulous frosting twist. If you’re a fan of the original, I think you’ll just love these! 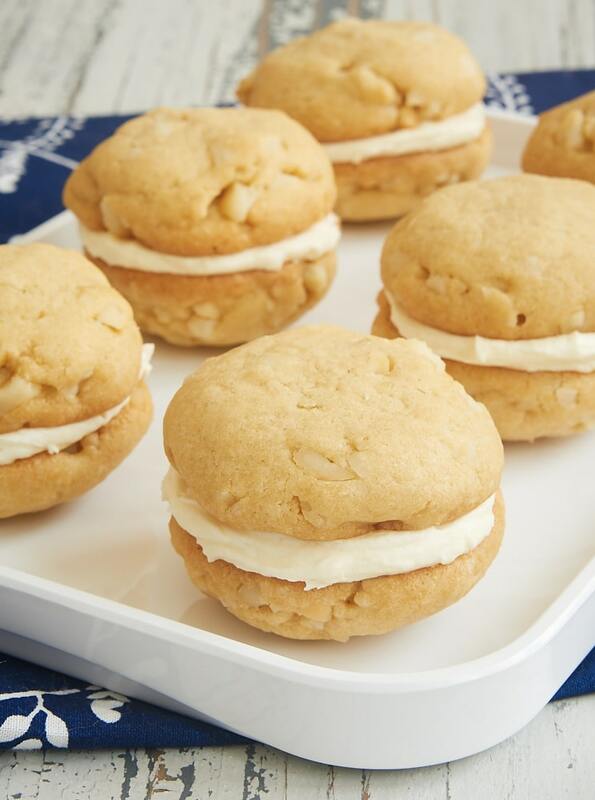 White Chocolate Macadamia Sandwich Cookies are a fun, frosted twist on a classic cookie. Reduce mixer speed to low. Gradually add the flour mixture, mixing just until combined. Stir in the macadamias. Scoop the dough into 1-tablespoon portions. Roll each portion between the palms of your hands to form a ball. Place the dough balls on the prepared pans. Flatten the top of each ball slightly. Bake 12 to 14 minutes, or until the edges are lightly browned and the tops appear set. Cool on the pans for 10 minutes. Then transfer the cookies to a wire rack to cool completely. Using an electric mixer on medium speed, beat the butter and confectioners’ sugar until light and fluffy. Add the cooled white chocolate and vanilla, and mix until thoroughly combined and smooth. Spread frosting on the bottoms of half of the cooled cookies. Top with the other cookies so that the bottoms of the cookies are facing each other. *Melt the white chocolate in a double boiler or in the microwave. To melt in the microwave, place the white chocolate (roughly chopped) in a microwave-safe bowl. Heat at half-power in 20 second increments, stirring after each heating, until the chocolate melts when stirred.